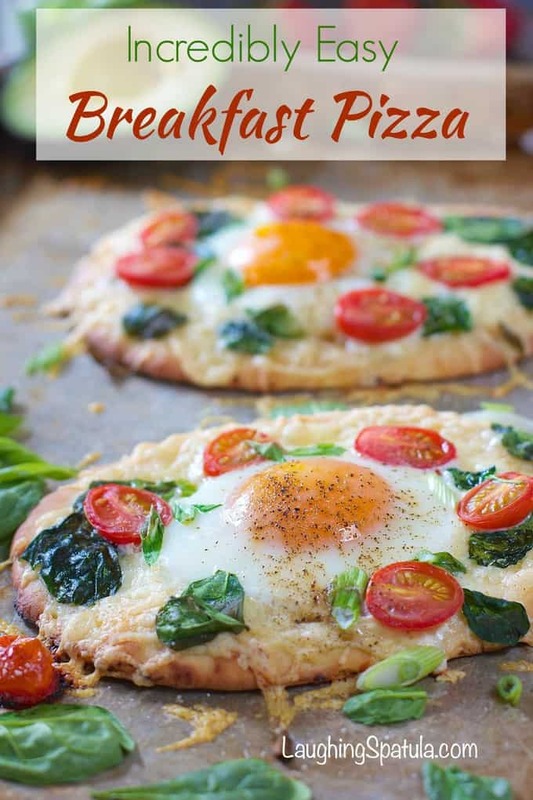 Easy Breakfast Pizza! 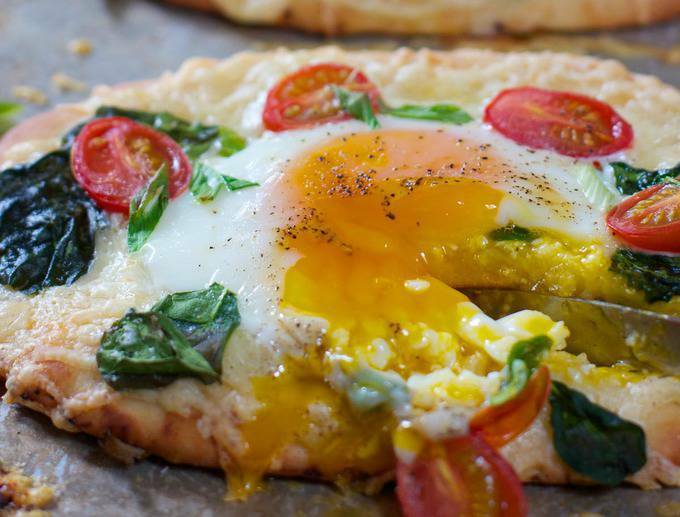 – Make this 10 minute breakfast using fresh ingredients and store bought Naan bread! 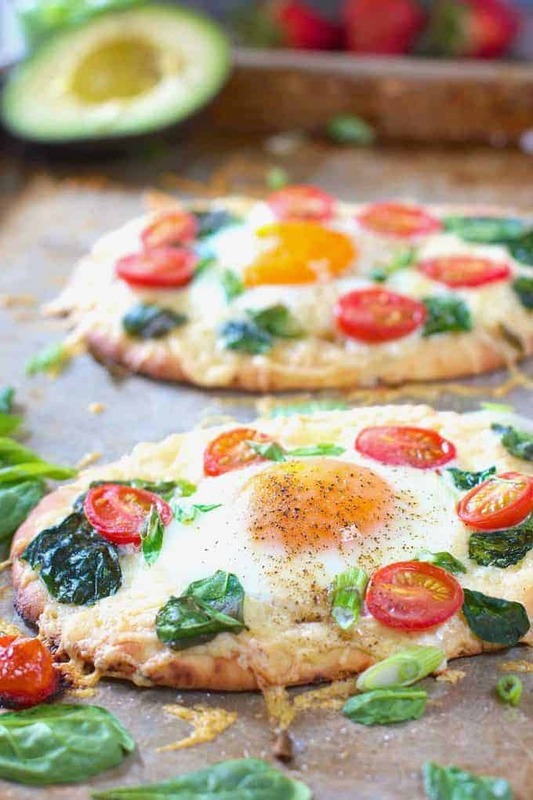 Eggs are becoming dinner and pizza is becoming breakfast…I love my life! Do not be fooled by the simple exterior of this pizza. These little beauties are packed with flavor. Gruyere on the bottom and some perfect baked eggs on top! 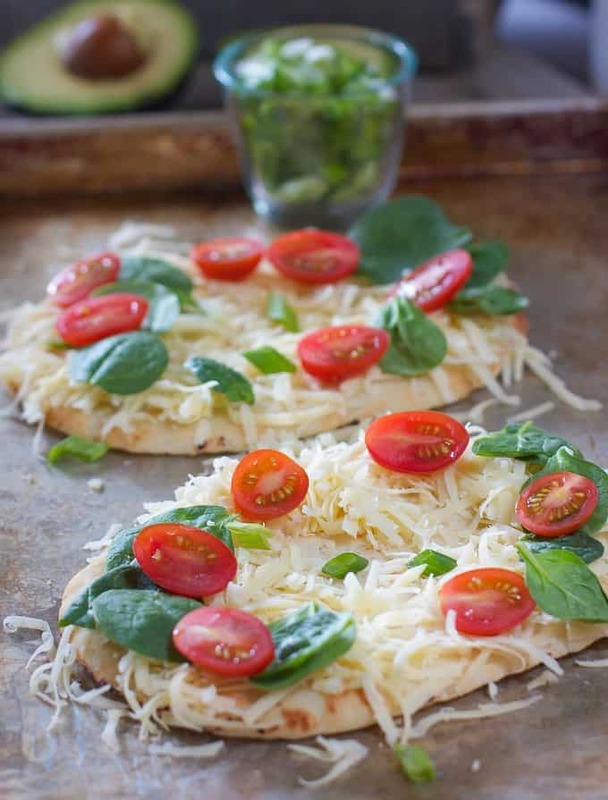 Simply top your crust with cheese, spinach and tomatoes. I like to spread the cheese a bit thicker around the edge to make a little bed for the egg….comfy eggs are happy eggs. Crack your egg into a small ramekin or bowl. (I like to say ramekin because it makes me sound all cheffy and stuff). Pour your egg onto the center of the cheese. Bake for about 10 minutes. This recipe is from my daughter Rachel, who is my new partner on The Spatula. (You can read more about that here). She is doing all the marketing and social media so I can become incredibly lazy and travel the world :). It’s amazing what she has done to improve this site in such a short period of time. Proud Mom? Darn straight! These would be great served with fresh fruit and mimosas! (sorry for the !!!!! overload in todays post. I am just really excited about this pizza!! !…oops, there I go again!). 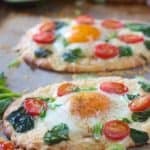 You can see all our breakfast recipes here. One of my all time favorites is this Blueberry and Cream Cheese French Toast Casserole. Great for a crowd! 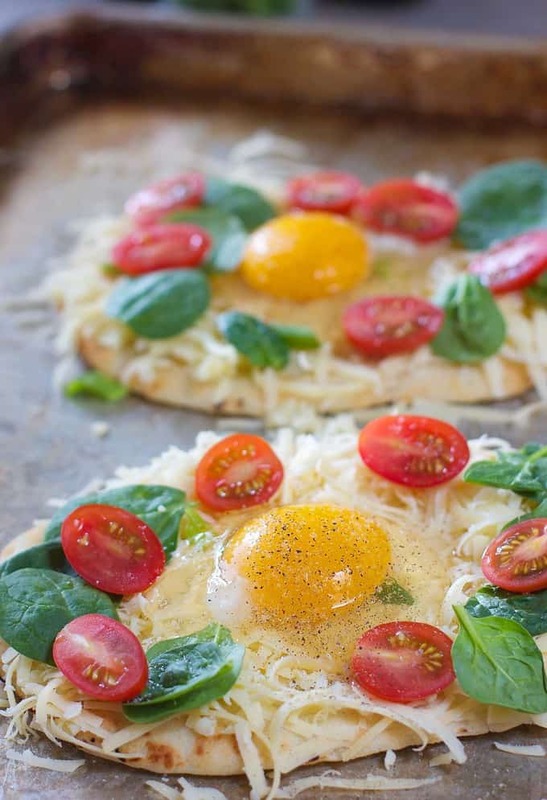 Pizza for breakfast...yes please! 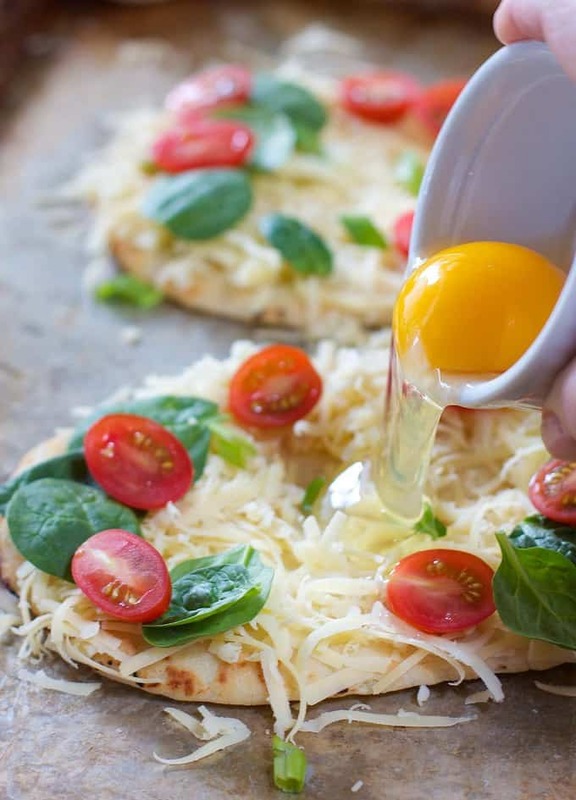 Incredibly easy recipe made forms store bought naan bread, cheese and fresh eggs! Top each crust with 1/4 cup cheese (building the cheese around the edges and leaving an indent for the egg). 1/3 cup spinach, 1/4 cup sliced tomato and 1/8 cup sliced green onion. Crack one egg into small bowl, one at a time. Gently pour egg onto center of crust. Carefully place sheet pan in oven and bake for 10 minutes. Check to see that the whites of the egg are fully cooked but the center of the yolk remains soft. Adjust cooking time accordingly. Sprinkle with salt and pepper and serve hot! 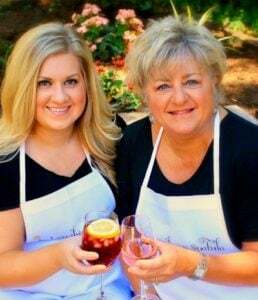 Great served with fresh fruit and mimosas! Love that idea! Hope you get a chance to try it! I love eggs for dinner. Someone laughed at me the other day when I said that, but that’s my story and I’m sticking to it. These pizzas look SO good!